Extreme volatility in the currency market and drastic depreciation of the rupee is a matter of grave concern to all stake holders. Various theories are discussed to find out the true value of the rupee and policy makers have taken some steps to strengthen the exchange rate but most of these policy decisions have yielded only limited results. 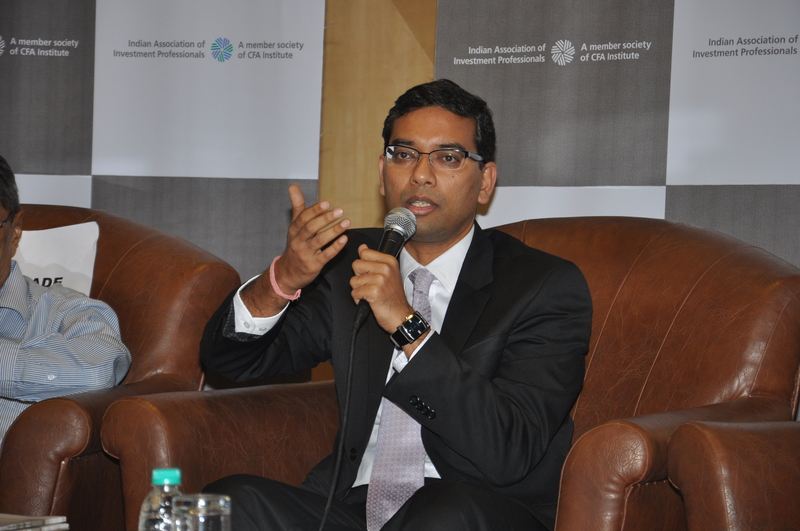 To analyse this situation in greater detail, IAIP organised a panel discussion on “FX Market Volatility in India, Current State and Future Prospects” in Mumbai on the 30th of August 2013. The esteemed set of panelists were A.V. Rajwade – Chairman of A.V. Rajwade & Co. Pvt. Ltd., Paritosh Mathur – Managing Director, Global Markets at Deutsche Bank, Siddhartha Sanyal – Director and Chief India Economist in the Emerging Markets Research team at Barclays and Venkat Thiagarajan – Vice President at Reliance Industries Ltd. Sonia Gandhi, CFA introduced the panelists and Jayesh Gandhi, CFA – President, IAIP, summed up event with a vote of thanks to the panelists and also applauded the enthusiasm of the volunteers and the audience. 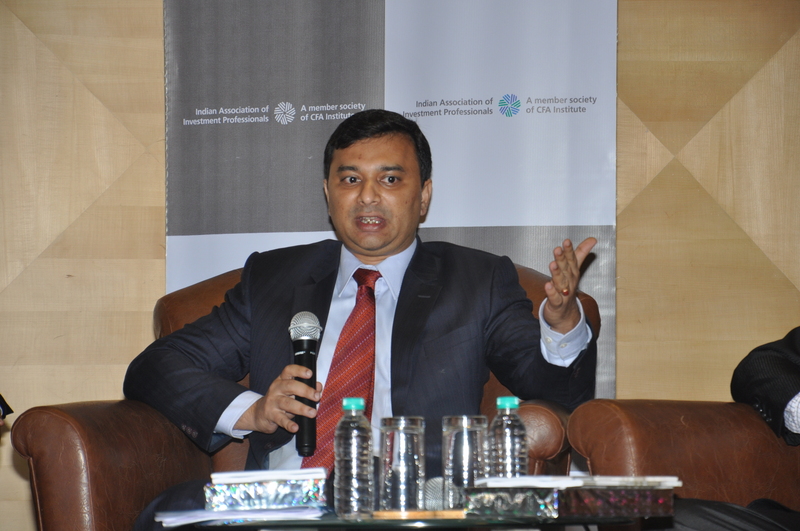 The event was moderated by Saurav Mishra, CFA – Director, IAIP and was well received by a strong audience. Following are the excerpts from the panel discussion. Businesses which deal in export/ import transactions should not view at currency fluctuations as an opportunity to speculate. On the contrary, currency hedging instruments are like insurance products which should be used to protect business margins from currency fluctuations. Structured products are used to hide risks and costs but even the zero cost products are not zero risk hence there can be substantial losses if the market doesn’t behave as expected. With respect to India, there is an inherent mismatch in the demand and supply of hedging products. Demand stems from Import, ECBs, FCCBs etc and is to the tune of $ 800 bn/ year whereas supply comes only from the exporters hence net external liabilities have increased to $ 300 bn. Coming to the current situation, Rajwade mentioned that our policy makers focus more on ways for financing the CAD rather than reducing the total quantum of CAD. Efforts should be more on recovery of the real economy since it creates jobs and is directly linked to the eventual output. Tight monetary and fiscal policy is the need of the hour. Undervalued exchange rate will encourage savings whereas overvalued exchange rate will encourage consumption. Currency was expected to depreciate overtime due to consistently higher inflation and CAD but the sudden depreciation of 20-25% in last three months has impacted the most. Monetary policy till now was only focused on the growth –inflation matrix which has affected the currency due to higher CAD. RBI only intervened in the forex market to reduce the volatility but recent decision of channelizing the USD purchases for oil demand was an important step to boost the rupee. Short term yield curve will continue to remain elevated until the velocity of currency movement reduces. With government’s renewed focus on export promotion and import substitution, CAD is expected to drop below $ 80 bn in FY14. QE taper is already priced in and bond yields should de-couple from currency movement unless fiscal slippage happens. Globally, capital has been waiting on the fence to be invested but with the currency movement and drop in growth rate in emerging market economies have reduced their edge helping US to regain focus. Siddhartha Sanyal – Director and Chief India Economist in the Emerging Markets Research team at Barclays, India. Import bill has shot up substantially and is expected to remain elevated since oil is at an all-time high in rupee terms. RBI will intervene in the forex market only to smoothen the currency movement rather than hold the rupee at a pre-specified level. Sudden depreciation of rupee will not help exports in major way since productivity improvement is also important but import substitution will also take place, helping to reduce CAD. Growth has dropped to 4.4% and it will be difficult to convince investors to fund our CAD which exposes us to a serious threat of rating downgrade. But Siddhartha is positive on the rupee in the near term owing to the fact that in the last two weeks even though FIIs have sold off investments in debt and equity markets, the money has not left India which is contrary to the situation couple of months ago. Policy makers are working on various ways to strengthen the currency and the rupee expected to stabilise around the level of 60 but further interest rate tightening could be a dampener. 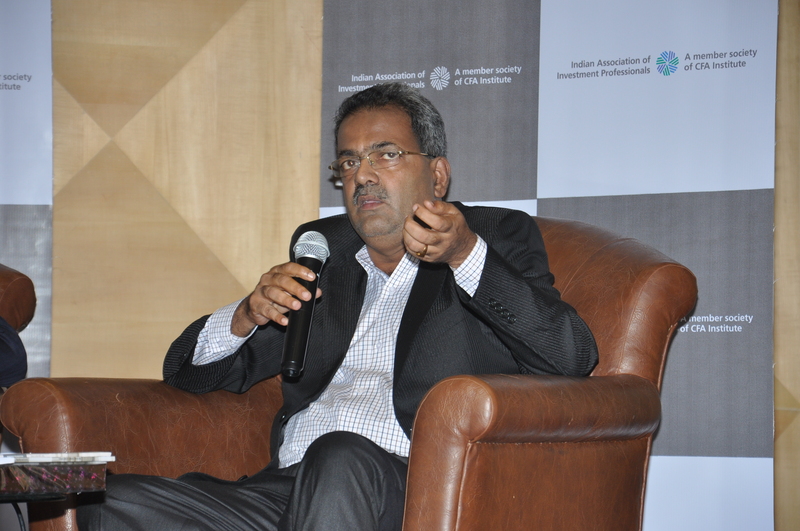 Venkat Thiagarajan – Vice President at Reliance Industries Ltd, India. ade to GDP ratio of India is very low and hence rupee depreciation will not affect the real economy. Government has to focus more on improving productivity, promoting exports and curtailing imports of non-essential commodities. There are many risks to the rupee in the near term due to QE tapering since yields are rising in developed markets leading to much lower investment flows but the biggest event risk will be general elections. The new government will take time to understand the situation which would delay policy decisions and can further depreciate the rupee. 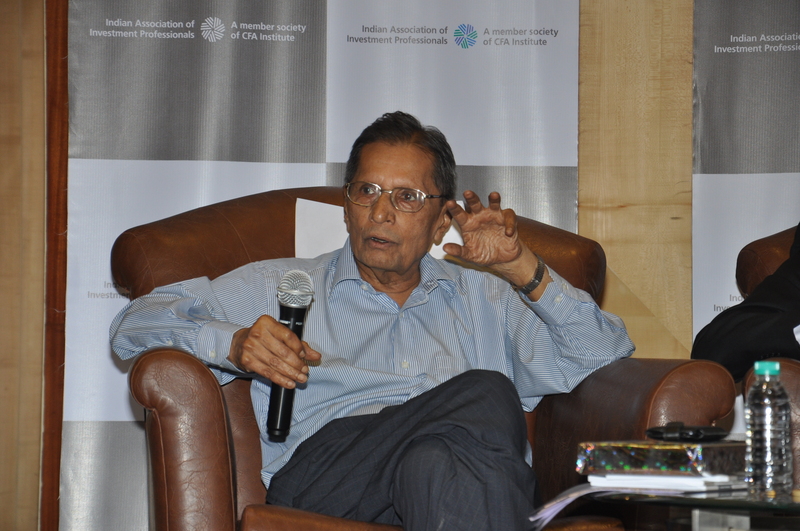 Gallery | This entry was posted in Events, Mumbai, Panel Discussion and tagged A V Rajwade, A.V. Rajwade & Co. Pvt. Ltd., Barclays, Deutsche Bank, IAIP, Indian Association of Investment Professionals, Jayesh Gandhi CFA, Jignesh Kamani CFA, Kunal Sabnis CFA, Paritosh Mathur, Reliance Industries Ltd., Saurav Mishra CFA, Siddhartha Sanyal, Sonia Gandhi CFA, Venkat Thiagarajan. Bookmark the permalink.